Joan (Horn) Nelson was born on March 10, 1938, in St. Lawrence, SD. She was the oldest of 8 kids and grew up on a farm, but dreamed of moving away and having a career. After high school she went to nursing school, became an RN, and decided to move out of South Dakota, to the big city. She lived with friends in the Minneapolis/St. Paul area and worked at Methodist Hospital, in St. Louis Park. She met her husband, Lars, on a blind date, and they married in 1963. They built a house in Burnsville, MN, where they lived and raised two daughters, until moving to Luverne, MN in 1982. Joan loved to bake, cook, sew, read, and work in the garden. She was a wonderful, supportive mother and wife. 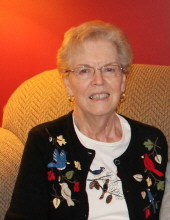 She was active in the community, volunteered at Grace Lutheran Church, and was a high school band booster. She continued nursing in Luverne and later in Sioux Falls, SD, until she retired. She and Lars moved to Alexandria, MN in 1995, where they enjoyed an active retirement. They loved to travel, volunteer, and often visited their three grandchildren. After Lars passed away in 2014, Joan moved to Appleton, WI, to be closer to family. She lived in the memory care unit at Touchmark for the last year and a half, where she was blessed to have amazing staff and caregivers watching over her. She joined Lars in Heaven on February 28, after suffering a stroke. Joan was preceded in death by her parents, Alice (Cox) and Chester “Earl” Horn, her brothers Earl “Ray” and Bob, and her husband, Lars. She is survived by her sisters Jean (Darel) Palm, Carol (Terry) Sommer, Sandy (Fred) Slunecka, her brothers Bill and Jerry (Meta), her daughters Wendy (Kevin) Malone, and Sarah (Jeff) Miles, grandchildren Sonja, Alex, and Madison, and many nieces and nephews. A celebration of life will take place at 3:00pm on May 18, at the North Site of First English Lutheran Church: 3661 N. Ballard Rd., Appleton, WI. To plant a tree in memory of Joan Nelson, please visit our Tribute Store. "Email Address" would like to share the life celebration of Joan Nelson. Click on the "link" to go to share a favorite memory or leave a condolence message for the family.